Winter has proven to be a very dangerous time of year for heart attack risk, not only because of severe cold and icy conditions, but because of the effect it has on our physical health. If not prepared, people can be subjected to extreme conditions and deadly temperature drops which can be very hard on the body, and particularly rough on the heart. In fact, during winter, studies have shown that there is an increased heart attack risk. What makes this so, and how can it be prevented? During colder times of the year, the human body naturally prepares itself for harsh conditions. This is an inherent survival tactic that helps people adjust to drops in temperature. What does the body do in order to fight the elements? Blood pressure & cholesterol. Cold weather increases blood pressure and cholesterol. These are key factors in causing heart attacks and strokes. The levels rise in response to tightened blood vessels, causing an increase in blood flow. Blood flow speeds up to keep the body warm; cholesterol levels rise as well. Rises in blood pressure and cholesterol are significant factors in causing heart attacks, as well as strokes. Immune system. Blood levels within the immune system rise as temperatures decrease. This happens in order to prepare for winter illnesses such as cold or flu. As a potential result, extra plaque may build up along the artery walls of the heart. Plaque is known to compromise blood flow, which puts extra work on the heart. Combined with higher blood pressure, a hard working heart is not as capable of protecting itself from an attack in colder temperatures. Winter diet. Thinner bodies don’t hold up as well during a cold winter. In order to combat the lowered temperature, people tend to eat foods that are high in fat - a foundation for a poor diet. Foods higher in fat are higher in cholesterol, which builds up within the arteries and makes the heart work harder to pump blood through the body. Studies show that people also seem to consume more alcohol during the winter, possibly believing that liquor warms the body. Alcohol is one of the leading causes of heart disease. When considering how sudden a heart attack can be, it is all the more important to know the warning signs before one occurs. Awareness of these indicators helps potential heart attack victims know when to seek emergency care, and to also help medical professionals make a prompt diagnosis for immediate action. Chest pain. Despite the common misconception that chest pain is the first and most prominent sign, a heart attack can present itself in many different ways. Chest pain is more likely to be the case with men than with women, who often report other primary symptoms (see below). Regardless of frequency, any sudden chest pain should be a cause for concern. 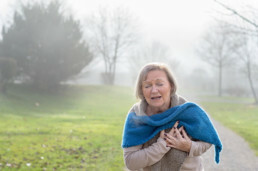 Victims suffering with chest pain will also feel pressure on the chest which may go on for a few minutes, or occur in patterns. Nausea & Vomiting. This may be the subtlest of symptoms, as nausea and vomiting often result from a wide variety of illnesses. Be sure not to mistake these symptoms as just a reaction to a large winter meal. Upper body pain. Many people associate this as a sharp pain in the left arm. While this can certainly be a warning sign, it is important to know that pain can occur elsewhere. The back, shoulders, neck, jaw and abdomen may also experience severe pain. Aside from the more well-known warning signs, the lesser known silent heart attack may be the most alarming. This type of attack will occur with little to no symptoms at all, and should be taken seriously. Frighteningly, a 2016 study suggests that up to 45% of heart attacks are silent. These are reasons why it is even more important to be health conscious and aware of the higher potential for heart attack risk during winter. There are several things to consider in taking better care of one's health during winter to avoid heart attack risk. These preparations include to lowering cholesterol, maintaining a stable blood pressure level and promoting a healthy immune system. Stay Warm. Maintaining a regulated body temperature is the best possible way the keep the heart from overworking itself in the cold winter months. This keeps the blood vessels from tightening, thus reducing the need for rapid blood flow to help keep the body warm. Dress in comfortable layers, paired with a hat and gloves. Go inside frequently. By returning indoors often, the body isn’t exposed to lower temperatures for extended periods of time. Take a fifteen-minute time out from outdoor activities, preferably while sitting by the fireplace with some piping hot cocoa. Healthy Diet. While it may be tempting to go for second helpings during those comforting hot winter meals, remember that high fat leads to high cholesterol, which strains the heart. Heavier meals should be consumed in moderation, while sticking to heart healthy foods for the majority the time. Food such as oats, healthy low-sodium nuts, fresh berries and fish high in Omega-3 fatty acids all work together to lower cholesterol. Understanding how cold weather affects the heart and being better prepared provides the necessary tools for a safe and heart-healthy winter. If you or a loved one experiences chest pain other symptoms of a heart attack, visit one of The Emergency Center’s convenient 24-hour locations in Arlington, Fort Worth, and San Antonio.